With a name like Joy Bay, how could one not go there? Actually, it’s a bit off the beaten track, and not so many people do go up that way – this is so metaphorical! But it’s a beautiful spot, and was a really good place to get out of the weather a couple of weeks ago. It’s about 5 miles up from the open water, at the north end of Gouldsboro Bay, with a nice spot for getting out of the way of southeast winds. And blessedly quiet, other than the fellow who lives on his sailboat anchored up there, with lines of Jerry cans along the rail for supporting his many hours of generator use each day. But even that couldn’t take away from the surrounding stillness. It was lovely. This all feels so long ago, along about now. Presently I’m in Belfast, at the town dock, and have been here for a few days. Suzanne has driven up from Holyoke for visiting and “shore support,” and has just now set off on her way home. The hole in the sail is patched, and fun stuff is done, like replacing the little outdoor thermometer on the tabernacle that was mysteriously broken a couple of weeks ago. And finally we’ve attached the “hailing port” sign, below the name board on the back of the boat, so people can see where the boat is from. Already this has changed the pattern of dockside conversations with folks passing by. Everyone with any connection to Massachusetts specifically says hello! In between Joy Bay and here, there were five long days of sailing each day, anchoring at night, gradually working west in winds that were generally light and from some version of west themselves. This felt like a lot of work! 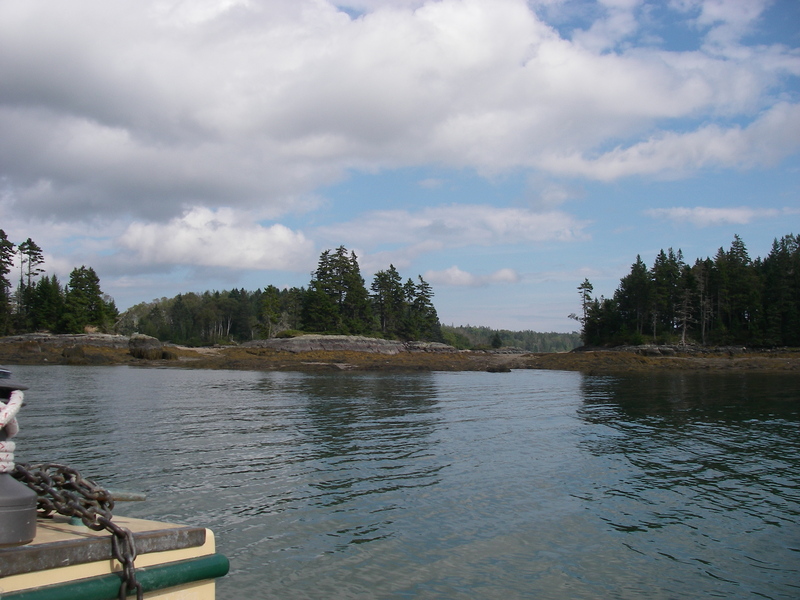 Then a couple of nights at Holbrook Island, just outside of Castine, and another long day to go about 8 miles upwind to Belfast. The most exciting thing in these past couple of weeks has been the lovely visiting. Folks came to say hello in Joy Bay, and that was so much fun that on the way out, after the storm that took me there in the first place, I got to stop at their dock and visit some more. Which gave me a chance to hear more stories about the fellow with the generator, and to have the treat of being at a dock for the first time in at least three weeks. I’d been off the boat a while back with the packraft, at the beach on Birch Island, but there’s something special about the feeling of a flat, level surface under one’s feet, wide enough to move in any direction. Thank you Chubba! And then at Holbrook Island, Joanne, whom I met last year in Belfast, came out with her sailboat to spend the day. This was interesting for even more than the basic visiting, which was lovely in itself. The forecast was for quite strong winds in the afternoon, gusting into the 20s and 30s, and we debated about the best arrangement for visiting. We’d had conversations about rafting the two boats together, hers a very sturdy and substantial Pacific Seacraft 25, and this one 20 feet and a good bit lighter. Knowing that we were in a fairly snug spot immediately behind Holbrook Island, and still being morning before the wind had really gotten in gear, we decided to go ahead and try rafting. This is a bit against conventional wisdom, which says that rafting – tying two or more boats alongside one another while anchored – is something for calm conditions. But we figured that the wind was not really blowing yet, and we could always change if doing something different started to seem appropriate. So she brought her boat alongside AUKLET, dock lines were attached, and the two boats were doing fine on my rather oversized anchor. After a bit the breeze did start to come up, and it looked quite doable to keep the boats together, but to put out the Pacific Seacraft’s anchor as well. The theory was that if the two anchors seemed troublesome, then we would raise mine and let both boats ride on the heavier anchor from Joanne’s boat, but I was hoping to not have to do that, since I really liked the spot where mine was set. And of course we could have also simply gone apart and anchored separately. Joanne had her dinghy, so we could then visit on one of the boats. But for the moment we decided to try tying alongside one another. So Joanne used her engine to move the two boats up, I gathered in the slack on my anchor line, we let the boats swing to starboard, and when it seemed like the second anchor would allow for something between 30 and 45° between the two anchor lines, Joanne dropped her anchor and we each let anchor line back out. With a little tinkering with lengths, pretty soon the two boats, rafted together, were resting on the two anchor lines, shifting the strain back and forth between the anchors as the wind varied, pretty much the same as if there was one boat on two anchors. It turned out that this worked really well! For an hour or two during the afternoon the wind really blew, with some waves, and spray, and bits of seaweed tossed up to the anchor roller. My little handheld wind gauge registered a gust at 25 knots, there in the harbor, though the steady wind where we were was more like 13 or 14 at that time. I’m really hoping that this post isn’t scaring anybody – it actually felt very secure, and I was quite positive that AUKLET was having a much nicer time with this big friend than we would have been having on our own. Much less swinging back and forth, and less being bounced around. A couple of days later I mentioned this to Joanne, and she said that she felt the same about her boat. Eventually the wind let up a bit, and it was time for Joanne to go off. We reversed our process – she hauled in her anchor, with bursts of motor power to help, and I took up the slack in my line. When her anchor was free I let out AUKLET’s line again, so we were back to a nice generous scope, and with the boats still tied together Joanne stowed her anchor and line. When everything was in order she cast off, and was on her way. So here is my question, for the folks reading this who know about these things: was there something we were missing, as far as understanding risks of what we just did? I’m not understanding why this is something that is “not done.” A partial explanation might be that it’s important to be monitoring what’s going on – Joanne and I did not go below and just think about other things. We were in one or the other cockpit, and then in AUKLET’s cabin, which has the windows all around for keeping an eye on what’s happening, and were paying attention as conditions changed. We did anchor line adjustments, carefully checked that there was no dragging, and noted that the dock lines holding the boats to one another were working fine. And that process was ongoing – it was a little more like visiting while sailing, rather than being anchored and “off duty.” But in that kind of wind, even with the boat anchored singly, a good bit of attention would be going on! And again, the boats seemed to do better than they would have alone, as far as stability and comfort. So that was a bit of adventure for the week, and comments are invited! I’d be enormously interested to hear both thoughts and experiences on this subject. Meantime, here I am in Belfast, eating great food and having lots of great conversations. It’ll be hard to leave! The plan is to stay until the wind shifts northerly. It’s a good long trip to the south end of Penobscot Bay, and nothing you want to try without the wind in your favor. Thunderstorms are forecast for tonight, and the beginning of a change tomorrow. But the tide is backwards in the afternoon, when it’s likely to clear up, so I’m looking toward first thing Saturday morning to set out again. Maybe I’ll even get to write another post before it’s time to go!